2 by 3 Heroes: Merry Christmas every one of us! I'll be watching the blogroll to see all the cards everyone received this Christmas season. Me? Nadda. Nothing. No one in my family gave me any cards. And that's ok, cuz where they fail, the blogging community steps in a fills the void. I have three envelopes that qualify as gifts this year, so let's see what Internet Santa brought me. 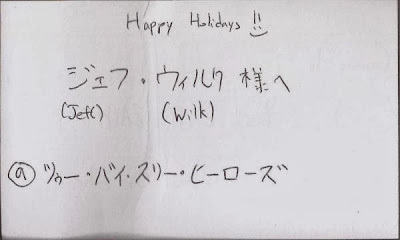 ZZ sent a few Christmas envelopes out, all with this card. He claims it's my name and blog title in Japanese, but considering I don't know the difference between J-pop and K-pop, it's possible he is calling me an uneducated warthog. And frankly, he has every right. Yet, the envelope he sent was wonderful. Here's some quick highlights. 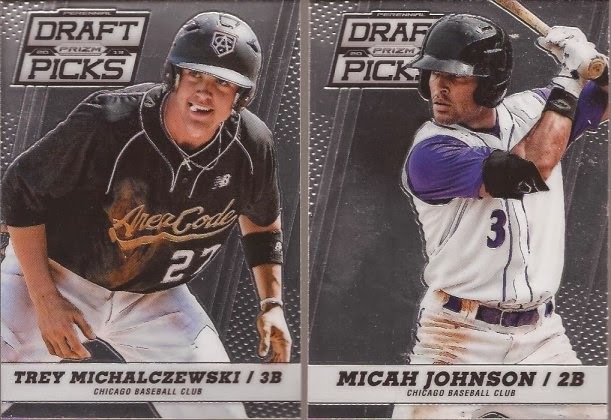 Two prospects from Panini Prizm. 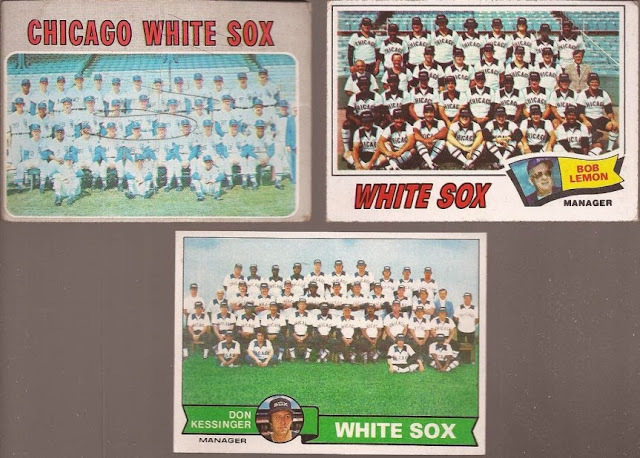 I am not big on the whole pre-rookie thing, but I am big on the White Sox thing, so these are great. And then it got even better. Vintage Sox team cards? Oh yeah! All three are lacking in my collection, or I should really say "were" since I now have them. Thanks a ton, Zippy! Next up, Jim from GCRL dropped a small envelope on me. Cool stuff like this was inside. I know there are a couple of these floating in the tubes of the net, and one finally showed up on the stoop of 2x3 Heroes. 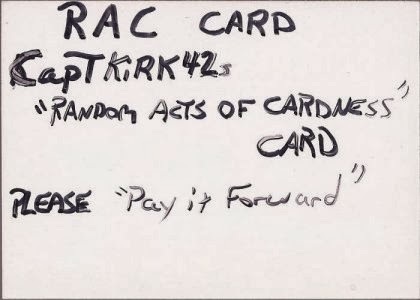 Basically, if you get this, you pay it forward by dropping something really nice on someone just cuz. The card also states the person in possession of the card on 12/31/13 has to get it back to Capt Kirk. I, however, already have a destination in mind, so the next person that gets the RAC card will be sending it to the Captain. So, how did GCRL show cardness? BOOM!!! That is some mighty fine vintage. I have been contemplating the direction I will go when the Pierce Project is complete, and I am considering a Fox Project. 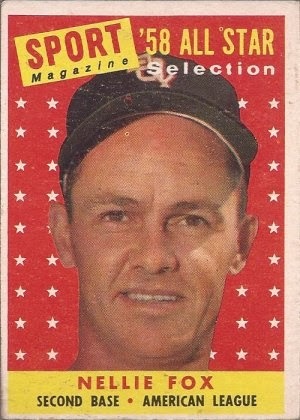 The last, and most amazing, gift came from Pat at Hot Corner Cards. We chat back and forth in Twitter DMs, and I think he was trying to get some idea from me about that very subject - the Pierce Project. He made sure that I will have to decide pretty quick what player is next. Technically, there are 3 white whales out there of Billy. 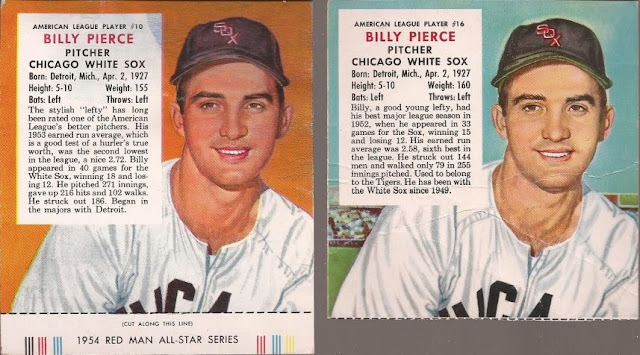 Being white whales, though, they were never considered part of the Pierce Project. Finding a Swift Meats, Robert Gould, or Salada Junket at a price I could afford make them pretty impossible. I left them off and as such, I have reached my goal. I cannot thank you enough, Pat, for these last two cards. Now I have to find some way to get you back. Alright - to you and yours, readers, a Merry Christmas, Happy Hanukkah, Happy Kwanza or whatever you celebrate. And if you don't go any of those routes, I hope you have a safe time this part of the year and just help spread the fact that it's really about caring for your fellow man and woman. Show some love - that's really what it's all about. that nellie came from my 58 sampler set. glad it went somewhere to be appreciated. happy holidays! Congrats on the Pierce project! Hope you had a very Merry Christmas.